Use an Ingate SIParator and you are “virtually there”! We have written on the subject of SBC quite extensively in the past and have also covered the easy installation of the Ingate product (see DrVoIP here). Readers must find this interesting because the hit counter for our Ingate videos continues to grow, indicating engineers are eager to learn more about this product. We generally regard ourselves as CISCO brats, but when it comes to Session Border Controllers, we remain deeply impressed with both the Ingate product and, most importantly, the Ingate support team! Pre-sales support is typically as good as it gets when developing a relationship with a vendor. Post sales support, however, is where the true value system of a company is tested and Ingate passes with high marks. Ingate, began shipping product as early as 2001 and has its roots in firewall security products. Ingate has now made its very popular SIParator Session Border controller available as a virtual software appliance. The SIParator E-SBC, scalable from 5 -20K sessions can be obtained as either a hardware appliance or as a software package. There are over 10K SIParators installed and working worldwide, making Ingate the “go to” knowledge base for documented SIP deployment experiences that is without equal on a global basis! Those of you working with ShoreTel have already discovered how powerful a vmware ESXi deployment can be. New options for fail safe, high availability and increased reliability magically appear when you virtualize your deployment! Ingate is no different and the availability of the Ingrate SIParator as a virtualized appliance adds a significant level of both reliability and flexibility to your ShoreTel deployment. The most widely asked question in the DrVoIP technical support forum: “Is there a need for a Session Border Controller?” Why can’t we just use our firewall is a common theme. Though it is possible to use a firewall to do a SIP trunk implementation, it is not our best practice recommendation to use a firewall in that way. Even firewalls with AGL SIP functionality fall short of the wide rage of features needed for true SIP arbitration. We are firm believers that firewalls already have enough work to do and are being attacked even more ferociously every day by a wider group of hackers and evil doers than ever before. 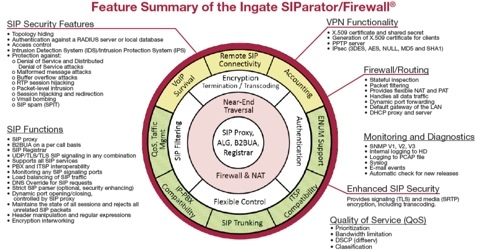 If you are committed to using a “firewall” to do SIP deployments, then we urge you to consider at least using an Ingate SIParator Firewall as a best of breed solution! Session Border Controllers have a lot of work to do! The concept of normalization alone could fill a text book. The fact is, not all SIP implementations are equal.It is often necessary to swap SIP message headers to achieve the desired results! Try getting your firewall, unless it is a SIParator, to do a SIP message header translation and you will quickly understand why a dedicated Session Boarder Controller makes sense! The software SIParator is easy to obtain, easy to install, easy to configure, and easy to license. Ingate has adopted a pay as you go philosophy, and though the software product scales from 5-2000 channels, you only pay for what you use! In fact, Ingate is so confident in the adoption rate of its product over competitors, they offer a 30 day free trial. Just click here to take advantage of this outstanding offer. The video is Part one of a two part video on the product! Part one shows how to obtain, download, and install the virtual SIParator software package. Part two goes through the configuration of the SIParator on a ShoreTel system for use in SIP trunking deployments. This material was previously covered in our YouTube video on Ingate and that material is still relevant!